My dad absolutely hates to waste food, so he tends to keep leftovers until they smell bad. Until then, they are safe to eat, as far as he’s concerned. Is that true? The safe storage time for leftovers depends on what foods are in question and also how the foods are stored. The bacteria that cause foodborne illnesses aren’t easily detectable to the naked eye nor by smell because these organisms do not affect the look, smell or taste of foods, according to the U.S. Department of Health and Human Services. 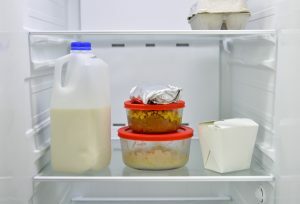 The safe storage time for leftovers depends on what foods are in question and also how the foods are stored. Generally, foods such as wet salads (egg, chicken, ham, tuna and macaroni) can be eaten safely up to five days after opening if stored correctly in a refrigerator. Foods like cooked meat or poultry and pizza are safe to eat within three to four days after preparation if stored correctly in a refrigerator. For more detailed information, you can refer to the safe food storage chart offered by Foodsafety.gov. While some foods can safely be consumed after the best-by date label like dried and canned foods, leftovers may support the growth of pathogenic bacteria and should be eaten quickly or discarded. Being aware of general food safety practices can help consumers avoid a foodborne illness, says Abigail Snyder, an assistant professor and food safety field specialist in the College of Food, Agricultural, and Environmental Sciences (CFAES) at The Ohio State University. Annually, some 48 million people get foodborne illnesses, leading to 128,000 hospitalizations and 3,000 deaths each year, according to estimates from the Centers for Disease Control and Prevention. Leaving food out of temperature control (e.g., refrigeration) for more than an hour or two is not a good idea because bacteria grow rapidly at room temperature when food reaches the temperature “danger zone” — between 40 and 140 degrees. While it may be tempting to think that re-heating food that’s been in the danger zone for too long will make it safe, that is incorrect. Some toxins produced by the bacteria can withstand cooking and can lead to illness. Washing raw meat, like chicken, under running water gets rid of pathogenic bacteria. This is false. Rinsing raw meat actually can increase your chance of getting a foodborne illness because the pathogenic bacteria can be spread to your sink, countertops and other kitchen surfaces. The only way to kill the bacteria from raw meat is through proper cooking times to reach the recommended internal temperature. More information on safe minimum cooking temperatures can be found at foodsafety.gov/keep/charts/mintemp.html. Not washing your hands before eating or after food preparation, especially after handling raw foods. Bacteria that can cause numerous illnesses can survive on many surfaces, including your hands. Therefore, you should always wash your hands for at least 20 seconds with soap and warm, running water before and after handling food. Heeding basic food safety practices can help prevent serious illnesses. With September designated as National Food Safety Education Month, now is a good time to learn more. Additional information on food safety can be found on the Centers for Disease Control and Prevention website at cdc.gov/nceh/ehs/News/Features/food-safety-month-2013.htm. My kids go back to school next week and I’m already stressing about what to pack for their daily lunches. Do you have any suggestions about how to make the process easier and the lunches more healthy? Planning ahead is one way to take the stress out of packing healthy, nutritious lunches that your kids will enjoy. Planning ahead is one way to take the stress out of packing healthy, nutritious lunches that your kids will enjoy. 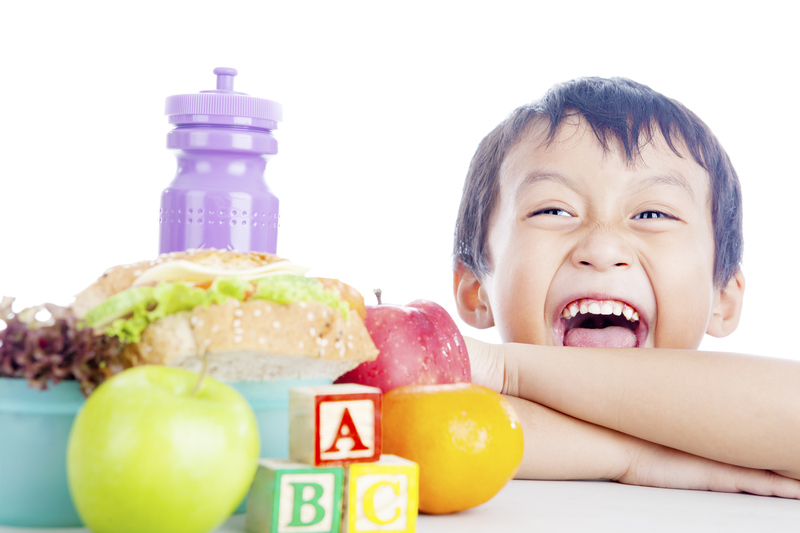 Before heading to the grocery store, plan a menu of what you want to pack in your kids’ lunches that week. Then, make a shopping list to ensure that you have what you need. 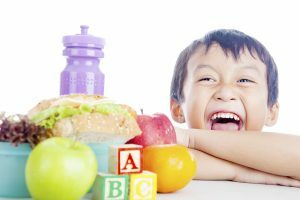 When packing your kids’ lunches, try to include a whole grain (e.g., whole-grain bread, pita, tortilla or crackers), a protein (e.g., lean lunch meat, tuna, peanut butter or beans), some form of calcium (e.g., milk, cheese or yogurt), and fruits and vegetables (canned, fresh or frozen), according to the U.S. Department of Agriculture’s guidelines for school lunches. The guidelines recommend that kids in kindergarten through fifth grade consume no more than 550–650 calories during lunch; students in sixth through eighth grades consume no more than 600–700 calories; and students in ninth through twelfth grades consume no more than 750–850 calories. Try to add variety to your kids’ lunches. Some suggestions include wraps, cracker sandwiches, little salads or bread-free sandwiches consisting of slices of lunch meat wrapped around cheese sticks. Repurpose meals by packing leftovers in plastic containers to send in your children’s lunches. You can also lightly steam vegetables or send other cooked foods, as long as they are kept hot. Freeze lunchbox-sized water bottles and yogurt tubes for your kids’ lunches. They will defrost, keeping the lunches cool for lunchtime. Insulated, soft-sided lunchboxes or bags are best for keeping food cold, but pack at least two ice sources with perishable food in any type of lunch bag or box that you use. Doing so can help keep perishable foods out of the bacterial danger zone — temperatures between 40 F and 140 F, at which bacteria grow most rapidly — until lunchtime. Remember to tell your kids to discard the perishable foods they don’t eat during lunch. The USDA advises that these foods should not be eaten later in the day. You should also clean your kids’ lunchboxes each night, either by wiping them down with a disinfectant wipe or by throwing the lunchboxes (depending on the types) into the dishwasher or washing machine at least once a week. Editor: This column was edited by Jenny Lobb, Family and Consumer Sciences educator for Ohio State University Extension. My dog loves to sit under the table during dinner near the kids’ chairs in hopes of finding tidbits that may fall from their plates. I’ve even given our dog portions of food from our meal. Is that ok? 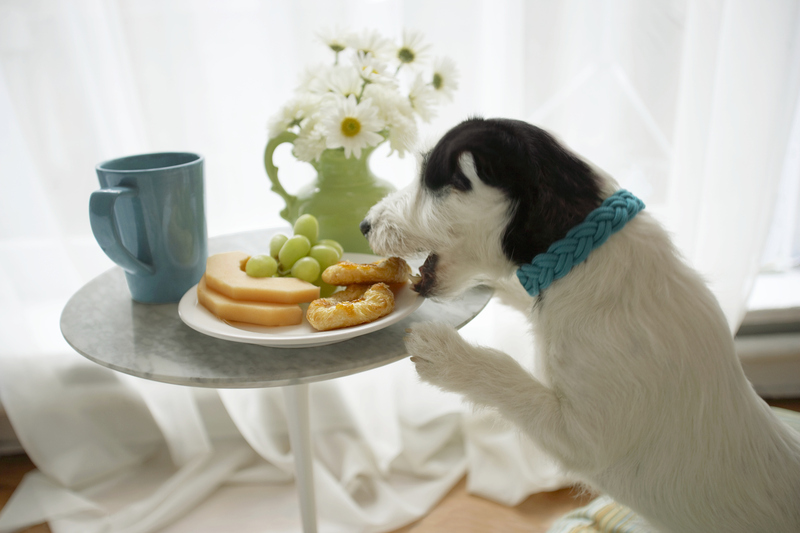 Grapes are among those foods not good for dogs to eat. In some cases, no, it’s not a good idea to feed your dog some foods that come from your dinner table. In a recent notice from the U. S. Food and Drug Administration, pet owners are reminded not to feed their dog some foods that are meant for human consumption. That’s because some foods people eat can be dangerous or even deadly for dogs, FDA says. An animal’s body processes food much differently than a human body, Carmela Stamper, a veterinarian at FDA, said in a written statement. “Our bodies may break down foods or other chemicals that a dog’s can’t tolerate,” she said. High on the list of human foods that dogs should not eat – chocolate and any food that contains xylitol, which is a sugar substitute that is used in many sugar-free foods. Chocolate contains methylxanthines, a stimulant that can stop a dog’s metabolic process. Even a small piece of chocolate, particularly dark chocolate, can result in your dog developing diarrhea and vomiting. And xylitol, which can also be found in some peanut butters, can be deadly for dogs, FDA warns. Raw meat. Just like in humans, any E. coli, Salmonella or other harmful bacteria that may be present in raw meat, can also make your dog sick. It’s also a good idea for you to wash your hands if you are handling raw meat before you give your dog anything to eat. Raw eggs. Just like raw meat, raw eggs can contain Salmonella. Also, raw eggs contain avidin, an enzyme that decreases the absorption of biotin. This can lead to skin and hair coat issues as well as cause neurologic problems in dogs. Grapes, raisins or currants. These foods can cause kidney failure in some dogs. Fried and fatty foods. These items can cause pancreatitis, a potentially life-threatening disease. Cinnamon. While cinnamon is not toxic to dogs, it can irritate the inside of dogs’ mouths and it can lower a dog’s blood sugar too much and can lead to diarrhea, vomiting, increased, or decreased heart rate, and even liver disease. Onions, garlic, and chives. Garlic can create anemia in dogs, causing side effects such as pale gums, elevated heart rate, weakness and collapsing. Poisoning from garlic and onions may have delayed symptoms, so if you think your dog may have eaten some, monitor him or her for a few days, not just right after consumption. However, since garlic and onion tend to be cumulative toxins, they are unlikely to cause a problem unless your dog ingests a very large amount at one time or eats them often, says Dr. Valerie Parker, a veterinarian and associate professor at The Ohio State University’s College of Veterinary Medicine. Moldy food. If you throw away moldy cheese rinds or hamburger buns in the trash can, make sure your dog doesn’t then get into the garbage, where he may eat them. Salty snacks. Salty snacks can increase water retention in some dogs. So if you dog happens to grab a bag of salty potato chips or pretzels, make sure your dog has access to plenty of water. Macadamia nuts. These are some of the most poisonous foods for dogs and can have a damaging effect on the dog’s nervous system. They can cause vomiting, increased body temperature, inability to walk and lethargy. Ice cream. As tempting as it may be to want to give your dog ice cream on a hot summer day, most dogs don’t digest dairy products well and many may also have lactose intolerance. So, while your dog may look longingly at you while you eat, you may want to resist the temptation to share your goodies until you are sure that the foods you are eating won’t have a negative impact on your dog. Talk to your veterinarian before introducing human foods to your dog to make sure that your good intentions don’t accidentally cause harm for your pets. Editor: This column was edited by Dr. Valerie Parker, DVM, an assistant professor, clinical, at The Ohio State University’s College of Veterinary Medicine.